McDreamy may be gone but Grey’s Anatomy isn’t going anywhere. The medical drama has been renewed for a 12th season on ABC. Grey’s Anatomy continues to follow the lives of the medical staff at the fictional Seattle Grace Hospital. 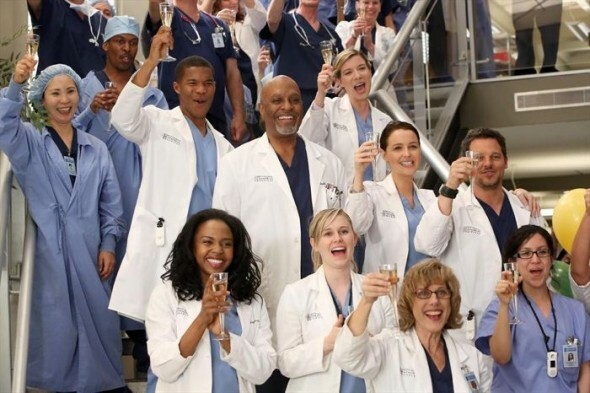 This season, the large cast included Ellen Pompeo, Patrick Dempsey, Justin Chambers, Chandra Wilson, James Pickens Jr., Sara Ramirez, Kevin McKidd, Jessica Capshaw, Sarah Drew, Jesse Williams, Camilla Luddington, Caterina Scorsone, and Jerrika Hinton. The ratings for Grey’s Anatomy have come way down over the years but it’s still one of the alphabet network’s top shows. The current season has averaged a 2.4 rating in the 18-49 demographic with 8.24 million viewers. That’s down by 11% in the demo and down by 3% in viewers. What do you think? Do you think the ratings will fall next season without McDreamy? How long can this venerable drama run? Brilliant Show,,,,It evokes every emotion, happy, sad, anger, surprise!!! Which is why we as Americans will ruin it! Please don’t take off Grey’s Anatomy! My favorite show. Maybe bring back Katherine Heigl,&a few more male & female hotties! Get rid of dorky guys!!! And bring it back on lifetime in Fl,during the day! Please don’t cancel this show! And bring it back on lifetime in Fl,during the day!